Ivanka Trump, adviser to President Donald Trump, examines a moon-rock sample collected in 1972 by Apollo 17 astronaut Jack Schmitt (left). Photo was taken on Dec. 11, 2017, in the White House, just after Trump signed Space Policy Directive 1, which directs to NASA to return people to the moon. MOFFETT FIELD, Calif. — The visual aid could've been a bit more visible. NASA brought a small piece of the moon to the Dec. 11 White House signing ceremony for Space Policy Directive 1, which instructs NASA to send astronauts back to the moon, and then on to Mars (but gives no details about timelines or budgets). "I'm explaining in this picture how big that sample was, compared to the [fragment] that we had to show the president," Schmitt said Wednesday (Jan. 10) at the Lunar Science for Landed Missions Workshop, which was held here at NASA's Ames Research Center. 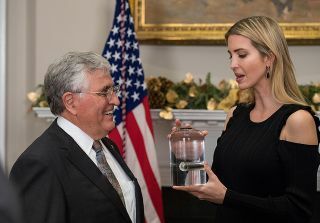 "This picture" is a photo from the signing ceremony that shows Schmitt and Ivanka Trump, President Donald Trump's daughter and adviser, examining the fragment, which was sealed in a clear container the size of a pickle jar. "And that's a lesson, Jim — we should've had a bigger rock," Schmitt said with a laugh, addressing NASA Planetary Science chief Jim Green, who was also in attendance at the workshop Wednesday. The comment elicited hearty laughter from the audience, which was composed of scientists, engineers and entrepreneurs interested in sending spacecraft to the lunar surface. Schmitt added that Ivanka Trump wasn't just feigning fascination with the moon rock for the cameras: "Ivanka was very interested in that." The moon rock known as Lunar Sample 70215 was collected by Apollo 17 astronauts in 1972. The sample weighs 14 grams, and was sliced off a parent rock that originally weighed 8,110 grams. The workshop crowd gave Schmitt — who has a doctorate in geology, and is the only trained scientist among the 12 Apollo moonwalkers — a standing ovation before his talk here Wednesday, which detailed the Apollo 17 sample-collecting efforts on the moon's surface in December 1972. His experiences, and those of his Apollo colleagues, could help guide the development of future moon missions, be they robotic or crewed. For example, Schmitt stressed that drilling into the lunar surface — which several future resource-prospecting craft aim to do — is a difficult task. The Apollo 13, 15, 16 and 17 missions carried rotary percussion drills that allowed astronauts to place heat probes up to 10 feet (3 meters) below the lunar surface and collect samples from a similar depth. These drills worked well going in, but pulling them out of the ground was tough, Schmitt said. "I think what happens is, the larger fragments rotate into the flutes, and, since it's incompressible down there, you can't move that fragment out of the way without an extraordinary amount of effort," he said. "On Apollo 15, Dave Scott actually wrenched his shoulder doing it." "We've got to think about that," Schmitt added. "Anybody who's thinking about drilling on the moon — I don't think we have those issues settled yet." NASA astronauts brought a total of 842 lbs. (382 kg) of lunar material back to Earth from 1969 to 1972 over the course of the six Apollo landed missions. Schmitt and his Apollo 17 crewmate Gene Cernan collected more than any other team — 243.7 lbs. (110.5 kg), according to NASA officials.